Less than 12 hours after police found an abandoned Geo Prism involved in a fatal hit-and-run early Sunday morning, the driver of the car was taken into custody. 48 year-old Robert Alleman was arrested at his house just a few blocks away from the area of PCH and Junipero Ave., where police say his car struck and killed 37 year-old Adolfo Lopez-Perez at around 12:45AM Sunday morning. A prelminary investigation revealed that the pedestrian was crossing Pacific Coast Highway southbound, west of Junipero Ave., when he was struck by a green 1997 Geo Prism, which was traveling eastbound on Pacific Coast Highway. Lopez-Perez was pronounced dead at the scene. The Prism was subsequently located nearby in the area of Temple Ave. and 17th St. and was impounded pending further investigation. Alleman was booked for vehicular manslaughter and is being held at the LB City Jail on $50,000 bail. Detectives are still asking for anyone who may have witnessed the collision to come forward. 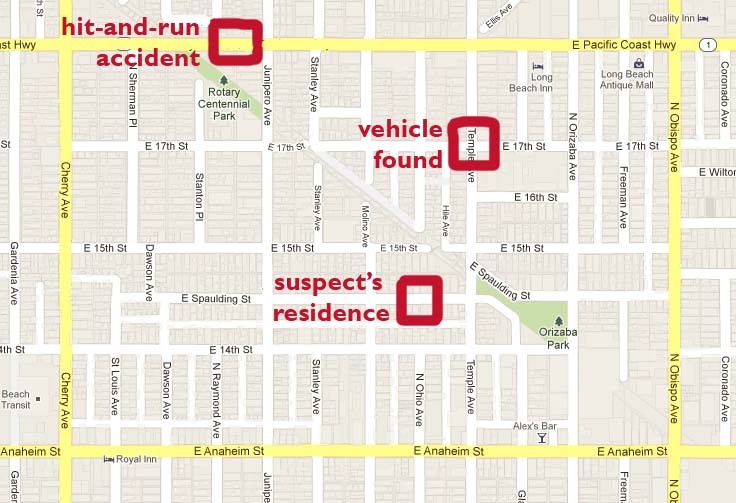 Anyone with information regarding this incident is urged to call Long Beach Police Accident Investigations Detective David Lauro at (562) 570-7355.